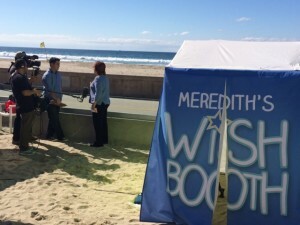 A woman’s wish for help for a struggling San Diego military family came true right before our eyes as part of our San Diego camera crews shooting for NBC’s “The Meredith Vieira Show.” It all unfolded during a two-day San Diego video shoot that began on the Mission Beach Boardwalk. 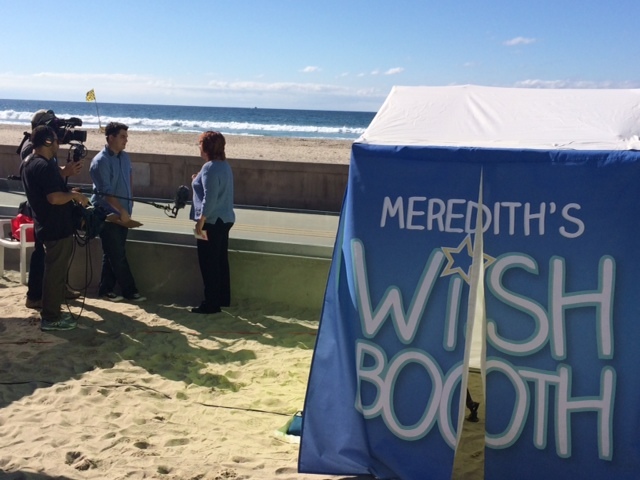 That’s where our seven-person production team built Meredith’s pop-up wish booth, installed two cameras inside, and stationed our San Diego video crew outside to interview people who stopped by to make wishes. One woman, a local social worker, asked for assistance for a Marine family having trouble coping financially as a result of the dad’s PTSD diagnosis and forced retirement. The family fell $20.000 in debt as a result of traveling to visit the dad during his hospital recovery at a hospital 150 miles from their home. The morning after the beach shoot, our San Diego video production team swooped into action to shoot a background piece on the unsuspecting family — interviewing the mom, dad and three kids at their home for what they thought was a story about struggling military families in general. A few days later, the still-unsuspecting family was flown to New York to appear live with Vieira on the show, where our background piece was played and they were introduced. Afterward, Vieira surprised them with a check for $20.000 from Ball Park Franks, along with $10.000 in merchandise from Boxed.com. Needless to say, sometimes wishes do come true! Solana Productions has more than 15 years of experience producing, shooting and editing projects for high-profile TV shows and corporate clients. With 14 EMMY Awards, a Gracie Award and many other accolades, our team brings high standards and professional expertise to every San Diego camera crews shoot.